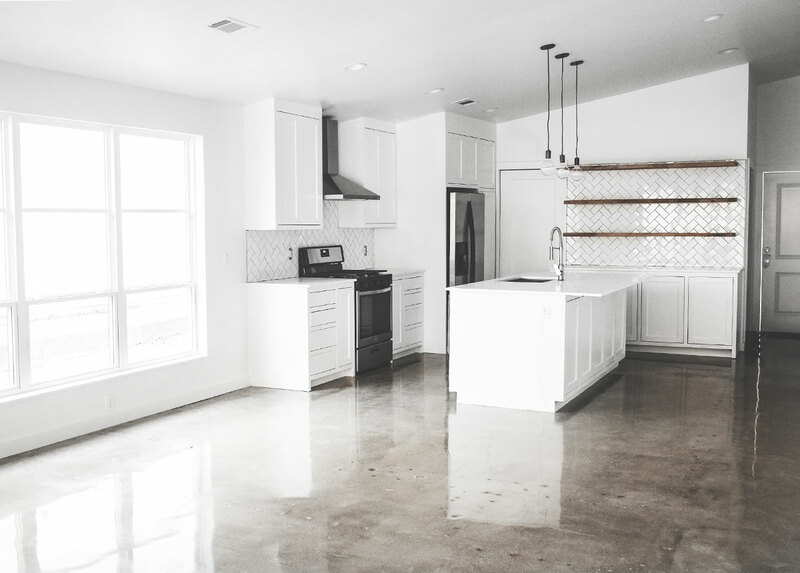 Renovating a home is a daunting task… trust me, when my husband told me he wanted to do this, my first answer was a HARD NO (given everything else we had on our plate at the time i.e. project #wethebirdsHQ)... read more about the construction journey for the house here. After I saw the little house for the first time, I was on board with the project because I [thankfully] had a clear vision of what we could achieve within the space! In this post, I'm sharing my process for designing & decorating the interior. Starting with a clear vision and plan made the whole renovation process go smoothly. Initial Questions— What do you want to do with the space? What elements do you absolutely need (# bedrooms, #bathrooms, laundry, etc)? What can you feasibly do within the space you have? These are all the questions that helped us solidify our layout for the reno before we even purchased the house. Layout— sketch out your new layout (using actual measurements) so you can ensure you have enough room for everything you need. This is like a puzzle, especially when you're renovating of a small space. I had the big rooms laid out in my mind, but when I started drawing, I couldn’t figure out where to put the powder room and laundry room! In my frustration, I considered dropping the powder room altogether (which was not ideal). We enlisted the help of our architect friends, Lauren and Houston Wurtele, and thank God for them— with their expertise, we were able to engineer the plans with efficient, space-saving solutions. Plus we ended up being able to include the powder room and laundry room! Moodboard— I put together a #moodboard for the project which included a color palette and inspiration images. I’m so grateful I did this work upfront because we referred to this board throughout the entire project... when it was time to pick out finishes, I already knew what I wanted thanks to my inspiration board. We pretty much stuck to the plan and didn’t deviate. I realize this may not be possible in all renovation projects, but sticking to the plan kept our project on schedule and made my life easier because I didn’t have to make design decisions along the way, I already knew what I wanted. Shop for finishes— Thanks to my moodbard, I had defined my finishes pretty early on. I knew that I wanted the rooms to be overwhelmingly white with black hardware and some metallic + natural wood elements. So when it came time to purchase the finishes, I would simply peruse Overstock or refer to my extensive wishlists. Because Overstock carries EVERYTHING you could possibly need to complete a reno, I sourced most of our finishes and decor from Overstock. My love for Overstock dates back many years (read more on that below)... but if you don't read any further, just know that you can find everything you need to complete a home reno on Overstock AND you don't have to break the bank because their pricing is easily the best you can find online. Natalie currently lives with me and my husband. While I definitely give Nat free reign when it comes to decorating her own room, for the most part, the house reno design & decor was my project. Thankfully, Nat and I align on overall design aesthetics. We would both describe our decorating style as "modern minimalism meets eclectic world traveler." We have a tendency to hold on to old pieces given to us by our mother or weird relics from Asia that have no value or use besides sitting on a shelf. Ultimately, we love to mix new pieces with old pieces. The furniture I've been working with since I graduated from college has been a haphazard accumulation of hand-me-downs from my mother combined with random thrift store finds. I think the only piece of furniture that I ever really splurged on was the sofa Thomas and I bought when we got married (that was 4 years ago). We actually downsized significantly with this house, which gave me an opportunity to reassess our furniture situation. Given that we were working so hard to renovate this little house and make it beautiful, I REALLY wanted to start fresh decor-wise. I felt compelled to make this house the little nest I've always dreamed of. I set out to find a partner that could help me complete the vision for our home. Overstock was my absolute first choice! My love for Overstock dates back to my earliest years of online shopping. I've joked that one of my favorite past-times is scrolling though the Overstock website. Its my version of an online "target-run". In recent years, Overstock has seriously cornered the market for ALL things home & decor, but its worth mentioning that you can find all kinds of cool things on their site— storage solutions, jewelry, clothing AND even beauty products (really... buy my fave Dior Foundation on Overstock now). One of the main reasons I love shopping on Overstock is because its pretty much a one-stop-shop. Overstock carries an insane array of products— its a literal goldmine for mixing and matching. Having the ability to filter by style, color, or price makes it super easy to narrow down your searches based on whatever you are specifically looking for. I sourced most of the finishes for BOTH of our construction projects (home and HQ) from Overstock (i.e. faucets, doorknobs, lighting fixtures). So when I was in construction mode, it also made sense to browse Overstock's furniture and decor options. I ended up creating extensive wishlists for both projects on Overstock. These lists ultimately made it really easy to gather, narrow and eventually order the items I wanted! 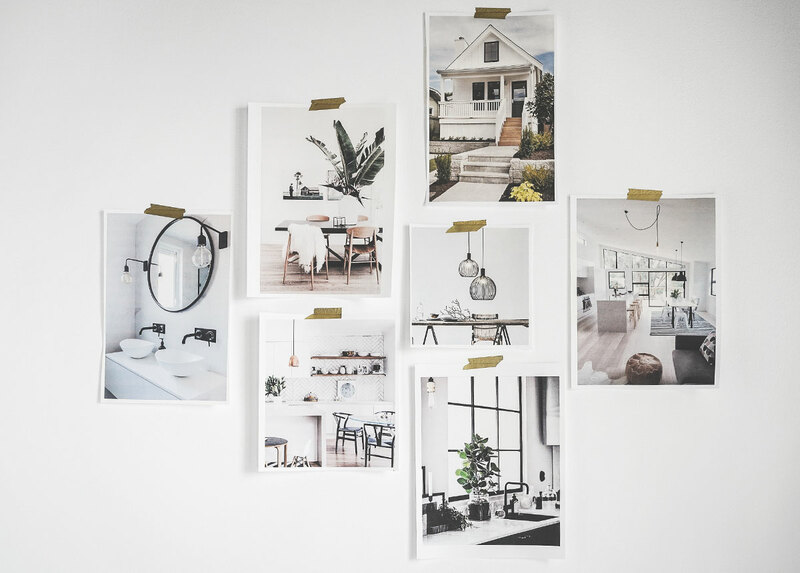 Below you'll find the visual inspiration board we referenced for the design of our home. I've also included my Overstock "Home Wishlist" (all products are listed and linked below the image so you can purchase these items yourself)!